Time: September 18, 2008, 7PM through 10 PM. 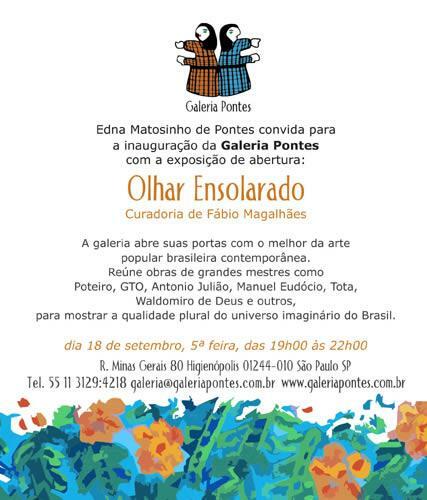 Edna Matosinho de Pontes sent out invitations for Galeria Pontes’ opening with the inauguration exhibit: Sunny Outlook – under Fábio Magalhães’ curatorship. The gallery opened its doors with the best of contemporary popular Brazilian art. Great masters’ works, such as Poteiro, GTO, Antonio Julião, Manuel Eudócio, Tota, Waldomiro de Deus and others were brought together so as to show the plural quality of the Brazilian imaginary universe. The art intellectuals call folk is beautiful just because, that is all there is to it. Creativity in the popular environment is always a matter of expertise. Often a very resourceful expertise through which the author proudly expresses his ability. But this artist knows his work is not just the result of his unique ability of working on materials (wood, clay, stone, etc. ), he knows he must express his fantasy by means of it. For the common person, creating is celebrating life and the world, and at the same time reinventing it. A celebrative, festive characteristic is predominant in popular expression and it enhances the cultural values of the social environment, establishes an intimate relationship between what is real (daily, trivial) and what is fantastic, between the concrete and the symbolic. Celebrating means intimately participating in the events in an integrated way. In other words, participating in life! To reinvent what is real in nature and its strength is not alienation, but a form of expressing one’s wish to be, to move sensuously within the world, to dream up Brazil. For the folk artist, creating is an integrative act that works against social exclusion, an act of identity assertion, belonging to the struggle for life. Nevertheless, it must be a pleasurable act. It is also a powerful weapon in the eternal combat between good and evil, angels and demons that confront each other to establish harmony and justice or conflict and disgrace. Folk art does not seek the status of erudite art. Historians were the ones who labeled art (academic, modern, contemporary or folk). The hands of the people follow their own rhythm and although they do not pursue any language forefront, their expression is hardly ever dated. They keep up the freshness of reinventing themselves every day, in public squares, in markets – in the midst of the people. Folk art usually reveals an emotional collectivity, a shared lively contemporary esthetics. The world we live in values individuality and erudite art does not contradict this rule. The artist pursues personal success (definitely his main social motivation) and submits to rules imposed by the market, his great judge. Therefore, it is not difficult to understand why an artistic expression that does not demand anything for itself remains an outsider, excluded, as is the case of folk art. Yet, the international modern art movement went after folk creativity sources. In Brazil, modernist artists such as Tarsila do Amaral, Di Cavalcanti, Cícero Dias and several others incorporated folk esthetic values in order to renew the artistic language of their time. Likewise the main intellectuals who formed the concept of modernity in Brazil, such as Oswald de Andrade, Mario de Andrade, Sergio Milliet and Mario Pedrosa, just to mention a few, turned their attention to folk artistic production and wrote about the vitality, ingenuity and beauty of this expression. In the 1960’s, folk art became very prominent in Brazil, among modern art collectors, and it was then that the most important art galleries included artists of folk expression into their scheduled exhibits. Shortly after materialized the first galleries entirely dedicated to this kind of artistic production. The recently opened Galeria Pontes is exclusively dedicated to folk art. It is the result of the loving sunny outlook of Edna Matosinho de Pontes, who travelled all over Brazil in search of pieces that inventively expressed the magic of Brazilian people and the force of our nature. Edna Matosinho de Pontes, a Brazilian art collector, psychologist and marketing research professional, opened the doors of her gallery in August 2008. When choosing artists and pieces, passion was Edna’s guide in her search for the horizons of authentic creativity. Thus, with patience and the necessary obstinacy, Edna Matosinho de Pontes amassed a rich and diversified collection. The works come from several very distant Brazilian regions – fahioned in the Amazon forest, Mato Grosso swampland, Goiás thickets, Jequitinhonha valley, Minas Gerais, Pernambuco hinterland, summing up the wide world they came from. The ensemble forms a landscape of the Brazilian soul, presenting a country dreamt of by its people, with exuberance, mysticism and sensuality. Galeria Pontes is in itself sunny, a rainbow. A space full of vitality. Energy that springs up non-stop, because folk art is germinal, bursting with life.